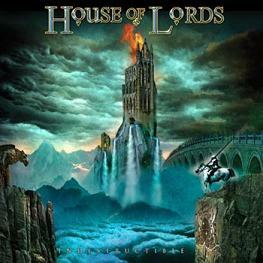 RockUnitedReviews: HOUSE OF LORDS: "Indestructible"
Indestructible and irresistible? The House Of Lords of present date are always going to face struggle... considering that keyboard genius Giuffria is nowhere to be seen/heard. The current line-up of James Christian (vocals), Jimi Bell (guitars), Chris McCarvill (bass), BJ Zampa (drums), are going at it without a keyboardist in the band and don't expect to find much or any of the sweeping ebony/ivory work of the past. Merely the toned down pattern in the background and guitarist Jimi Bell, who co-wrote most tracks, in the foreground with Christian's still rather strong soaring vocals above. The ballads are the only tracks where the keys are upfront and they've been known to go out on tour without the keyboardist. It's a darn solid line-up and album for that matter, but there's no proper Pomp. Not necessarily a bad thing. I just wanted to make things clear, in case you've been out of the loop for a very long time. "Indestructible" isn't far off from the band's previous releases as of lately, sound-wise, a little darker melodic rock, more direct and to the point than their first two albums. Guilty of losing a lot of their keys, they make up for it in quality songs that offer plenty of hooks and staying power. It's melodic hard rock that you can trust and rely on as you won't end up feeling disappointed at the end of the record. Christian, a little rougher, and not quite as high-pitched any longer. However, he's one of those vocalists that you also can always rely on for that matter. He make the instant impact and managed to stay/sound alert and hungry throughout the album. Kudos to wifey Robin Beck as she deliver background vocals as well as higher notes with technical finesse. Final verdict: Good stuff and not to be completely ignored by the masses.